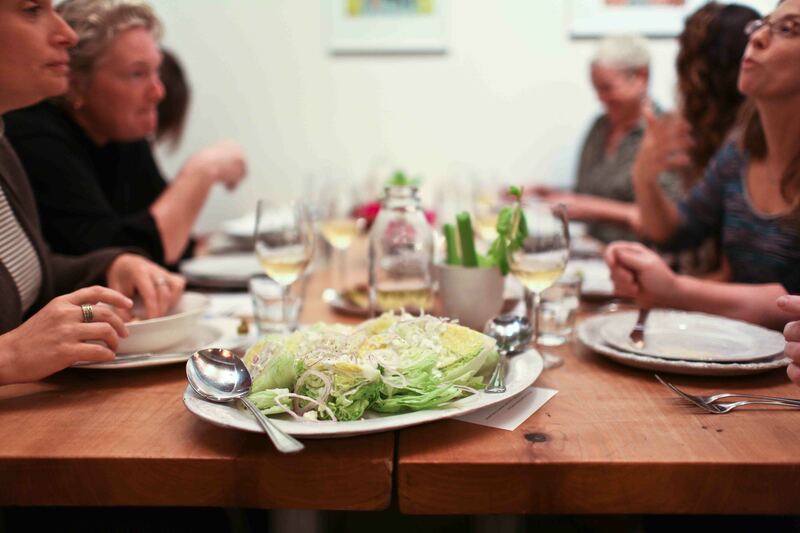 A four hour, hands-on cooking class culminating in dinner with wine. We love a good recipe and a beautiful cookbook. But ultimately, we want home cooks to find the freedom to move beyond precise measurements and detailed instructions. To meet this goal, 18 Reasons has developed a series of classes called One Meal, Many Tricks. Each class is designed to cover a variety of classic culinary techniques, the fundamentals of composing a well-balanced dish (e.g., the use of acid and salt, etc. ), and special skills and shortcuts that will make your time in the kitchen more enjoyable and efficient. Each course covers a different set of cooking fundamentals. Whereas in a traditional course you'd spend days, if not weeks, on sauces, we'll cover a sauce when it's appropriate - for example, after sautéing meat, when drippings coat the pan. We invite you to take a single class that covers topics most relevant or interesting for you; or, for a more comprehensive culinary training, please join us for several of these classes over the course of the year. We will be offering One Meal Many Tricks on a regular basis, and will take you through the seasons and around the kitchen by the end of the year. Michelle McKenzie is 18 Reason’s Program Director and Chef. She has a knack for making simple food seem special and is full of amazing tips for making every meal memorable. Michelle’s food seems at once healthy and hedonistic, elegant and effortless, and always attainable. She graduated from the University of North Carolina at Chapel Hill with a degree in nutrition and a minor in biochemistry, giving her a deep understanding of food properties and their complex implications within the human body. She later graduated from The Natural Gourmet Institute for Health and Culinary Arts, where she immersed herself in health-supportive cuisine prepared from whole, organic and seasonal foods. Since then, Michelle has worked at some of the best restaurants in the country and, most recently, spent five years directing NextCourse's Eat Ur Veggies program at Mission High School. Her cookbook, Dandelion & Quince: A Cookbook of Essential Wildlings, will be published by Roost Books in 2016.